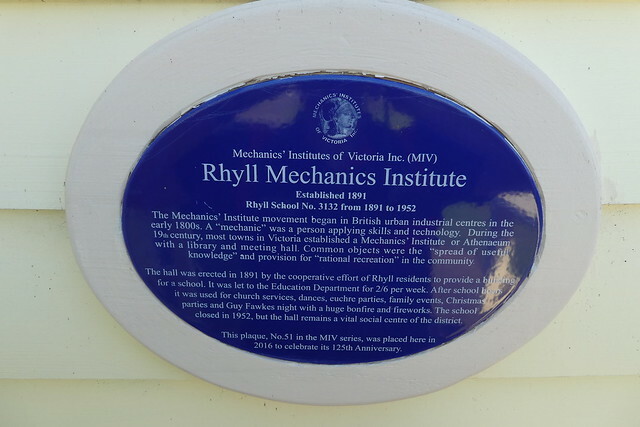 Rhyll Mechanics' Institute. Established 1891. Rhyll School No. 3132 from 1891 to 1952. The Mechanics' Institute movement began in British urban industrial centres in the early 1800s. A "mechanic" was a person applying skills and technology. During the 19th century, most towns in Victoria established a Mechanics' Institute or Athenaeum with a library and meeting hall. Common objects were the "spread of useful knowledge" and provision for "rational recreation" in the community. The hall was erected in 1891 by the cooperative effort of Rhyll residents to provide a building for a school. It was let to the Education department for 2/6 per week. After school hours it was used for church services, dances, euchre parties, family events, Christmas parties and Guy Fawkes night with a huge bonfire and fireworks. 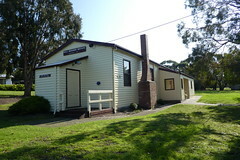 The school closed in 1952, but the hall remains a vital social centre of the district. This plaque, No. 51 in the MIV series, was placed here in 2016 to celebrate its 125th Anniversary.